What does Sara Bingham, WeeHands Founder, want to know about Diane Bahr's work and Everything from Bottles and Breathing to Healthy Speech Development? The following is the summary of a radio interview with Diane Bahr by Sara Bingham, WeeHands Founder. You may listen to the actual interview by clicking on the “radio interview” link in the previous sentence. During this interview Sara asks Diane about her work and her book Nobody Ever Told Me (or My Mother) That! Everything from Bottles and Breathing to Healthy Speech Development. This book was written as a resource for both parents and professionals (e.g., speech-language pathologists, occupational therapists, orofacial myofunctional therapists, lactation consultants, pediatricians, dentists, nurses, early interventionists, and others). 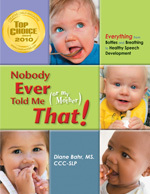 It contains many detailed checklists and practical techniques that parents and others can use to keep kids “on track” in feeding, speech, and mouth development (beginning at birth). SB: Tell us a little bit about where you grew up and what you were like as a child. DB: I grew up in Baltimore, Maryland. I am the youngest child of 3 children. My sister was on the autism spectrum which is probably one reason I became a speech-language pathologist. As a child, I loved to learn new things, and I still love learning. SB: You are introduced to someone at a child's birthday party. Describe what you do in two or three sentences. DB: I’m a speech-language pathologist, specifically trained in feeding and motor speech disorders. I’ve authored two books Oral Motor Assessment and Treatment: Ages and Stages (a textbook) and Nobody Ever Told Me (or My Mother) That! Everything from Bottles and Breathing to Healthy Speech Development (a parent-professional book). I’ve taught undergraduate, graduate, continuing education, and parent education courses. SB: How long have you been doing this? DB: I’ve been a speech-language pathologist for almost 35 years. SB: What’s the biggest lesson you’ve learned about what you do and the work you do with your company? Please share a story. DB: The biggest lesson I’ve learned is that therapists know a lot of secrets that typical parents never get to hear. This is the reason I wrote my parent-professional book. In my book, I give parents and professionals detailed information they don’t see in other parent books about feeding, mouth play, and communication development beginning at birth. It’s a proactive resource where parents can look up and read about “specific things to look for and do” in these areas before problems arise. While the book has information on mouth development through adolescence, it’s mostly focused on the birth to 3-year period when the majority of feeding, communication, and mouth development is occurring. Many health and development problems can be traced back to early feeding and mouth development issues. As one example: A significant amount of mouth development occurs during the first year of life (particularly in the first 6 months). This is when the mouth and nasal areas are being formed for life. Many children, particularly those who are bottle fed, develop high narrow palates (roofs of the mouth) and small nasal airways during this time. Small nasal airways can lead to many upper respiratory problems including sleep apnea. I talk about how to avoid these problems in my book and what to do about them if they occur. As another example: Many children are not introduced to food tastes, textures, and utensils on time and become “picky eaters.” I have seen this frequently in my practice. We have changed the timing of food introduction from 3 months to 6 months to give children’s digestive systems time to mature. However, parents now don’t seem to know when and how to introduce safe solid foods because they usually don’t have access to the developmental information that therapists have. Baby food companies make an attempt to provide some guidelines. But, the fact is that 6-month-old children are ready to begin to learn to eat from a spoon, take sips from an open cup and/or straw-cup, and finger feed. I teach parents how to safely and properly introduce foods and utensils in my book. SB: What’s your key piece of advice for new parents? DB: BE INFORMED. Get a good resource with accurate developmental checklists, so you can look up information as needed. My book is not a cover-to-cover read. We have free parent book guides by age and topic on our website, so parents can look up information as they need it beginning at birth. It’s overwhelming to be a parent. You are bombarded with information, so you need to get a resource that is accurate and that you can use as you need it. SB: What keeps you interested in doing what you do? Please share a story. DB: I continue to do what I do because I have learned a lot during my years of practice. I have had the unique opportunity to focus on feeding, motor speech, and mouth development most of my career. I speak with parents and therapists everyday who are dealing with problems in these areas. Last week I helped a family and their speech-language pathologist develop a plan to resolve a child’s persistent thumb-sucking which can ultimately affect a child’s dental and airway development. I have an 8-step process in my book to help resolve ongoing thumb and pacifier sucking. Good airway development is crucial for overall health. SB: What parenting or baby resource/product do you wish you had invented? Why? DB: I am still in the process of inventing resources for parents and professionals, so I haven’t stopped to think about this. I would love to see the multitude of checklists in my book as an APP, so parents can just “plug in” their child’s information to see if the child is “on track” and what they need to do next. In my book I have many specific checklists for feeding, mouth play and development, and communication. -How to track and encourage communication development because communication development is the first area to go “off track” when a child is on the autism spectrum. I have even placed a checklist in my book with the early characteristics of autism. I also recently developed an E-course. It is entitled Everything You Need to Know about a Baby’s Mouth for Good Feeding, Speech, and Mouth Development. While this course was developed as a continuing education course for professionals, it’s presented in such a way that parents and care providers can understand it. SB: What do you do to help your family get and stay connected? DB: Ironically, my family has rallied around our Ages and Stages® mission “to provide the best possible feeding, speech, and mouth development information for families and professionals” in order to “prevent problems in these areas” for all children. My husband is our business manager, and my daughter (who is also a speech-language pathologist) has helped with social media, blogs, Q & A’s, and so on. We have a lot of free information on our website (http://www.agesandstages.net/), and we encourage families and professionals to network with us. My daughter also has two young children who she has kept “on track” in feeding, speech, and mouth development by using my book. So, I guess that speaks well for the book. SB: Do you have inspirational quote or mantra for your family? DB: I always say, “Get the information you need WHEN you need it!” I recommend this for my own family and for parents. Parents may not have the benefit of their own parents living close by to teach and show them what to do, so parents often find themselves guessing about information that many therapists know. My goal is to help parents find the information they need when they need it. SB: Share the title of a favourite parenting book. Why do you love it? DB: In my book, I provide parents and care providers with an annotated bibliography of parenting resources, so I like many parenting books. We also have an ever-expanding resource list of related websites and companies on our website. However, I guess I would have to say that my own book is my favorite parenting book for feeding, speech, and mouth development. To my knowledge, there is no other book like it that gives parents the details of these processes for typically developing children. As previously mentioned, my book is a reference book loaded with checklists and specific techniques. The free parent book guides help parents navigate the information within the book as they need it. Additionally, parents should always speak with their pediatricians about the methods and resources they are using. In my book I make it clear that I am educating parents and not giving medical advice. I also believe that parents know their children best and should trust their own judgment once they have the information they need. SB: Are you on Twitter? Facebook? Please share where we can find you. DB: I am on Twitter, Facebook, Linked-In, Pinterest, and Google Plus. You can find these connections on our home page. Go to http://www.agesandstages.net/. Sara Bingham is the founder of WeeHands (a baby sign language company) and is author of The Baby Signing Book. Sara completed an honours Bachelor of Arts in Linguistics at the University of Ottawa and has earned a Bachelor of Arts in Psychology from Carleton University. In addition, she has earned an honours post-graduate diploma from Georgian College, as a Communicative Disorders Assistant. Quote from Sara: "My passion is helping parents and educators connect with the young children and beginning communicators in their care. Young children and individuals with developmental disabilities, at any age, want to communicate and share with you. Let me know if I can help!"